There are 4 individual plant cells in each Jeepers Creepers 4-pack. Our colorful purple colored plant cells are 2.35" long, 1.5" wide at the top and 2.33" deep. That's 3.48 fluid ounces per cell, 13.93 fl oz per 4-pack. The more Jeepers Creepers plant trays you buy, the more you save! Your savings get better the more plants that you purchase. Between the months of March through November, we ship your live plants FREE via Federal Express. Please note that we time our shipments carefully so they do not ship over the weekend and perhaps sit in a truck or warehouse waiting for delivery. 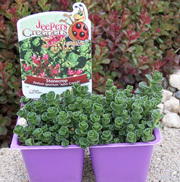 We want your Jeepers Creepers delivered to you fresh and ready to plant. If you have questions contact our friendly customer service department. We guarantee to ship only the healthiest, happiest plants from our house to yours. We take great pride in our quality and want nothing more than for the plants to come out of the box the same way they went in. If you have any concerns about your delivery, please let us know within 72 hours of arrival and we will be happy to replace or refund any sad plants. Our happiness depends on yours! We appreciate your understanding that we cannot be responsible for acts of nature, pest invasions or mishandling of plants after delivery..
Orders received before Friday will ship the following Monday. Orders received after this time will ship the next weeks Monday. A customer representative will contact you if shipping needs to be delayed due to the hot summer weather or for any other reason.